ATTENTION GPS AND GOOGLE MAPS USERS! The best, easiest, and most direct route to Sun Peaks Resort is via Highway 5 North, exiting at Tod Mountain Road by Heffley Creek, BC. Some GPS providers and Google Maps suggest an alternative dirt back road route off of Highway 1 near Pritchard, BC, and Chase, BC. This route not a recommended route for winter travel. 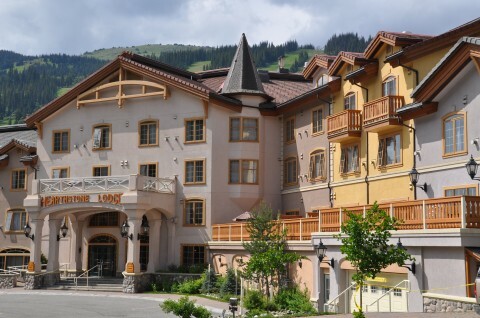 The Hearthstone Lodge is located in the village of the Sun Peaks Resort and only 45 minutes away from Kamloops, BC. From Hwy #5 northbound to Jasper out of Kamloops, turn off at Heffley Creek, 19 km north of Kamloops, 30 km south of Barriere. There is a blue sign for “Sun Peaks Resort” indicating the turn. Turn left at Heffley Creek Store and follow the Tod Mountain Road 26 km east to Sun Peaks Resort. The Hearthstone Lodge is well-signed and is directly accessible from the main road. Take TRANS-CANADA Highway 1 eastbound from Vancouver. Choose the COQUIHALLA Highway to Kamloops. Approx. 3 ¼ – 3 ½ hours. Once into Kamloops, take the Highway 5 EXIT northbound to Jasper. Approx. 25 kilometres. Look for signs to Heffley Creek and Sun Peaks Resort and turn right into Heffley Creek. Turn left at the Heffley General Store. There is a directional sign for Sun Peaks here. Proceed along this two-lane road up the mountain… all the way to Sun Peaks Village. Approx. 25 – 30 minutes. Cross the border into Canada at Sumas and take the TRANS-CANADA Highway 1 eastbound for Hope. Please bring 2 pieces of identity papers to get easily through Canadian Customs. After Hope, you will be given the option of three highways. Approx. 25 kilometres look for the signs to Heffley Creek and Sun Peaks and turn right into Heffley Creek. Proceed along this two-lane road up the mountain… all the way to Sun Peaks Village! Approx. 25-30 minutes. Take TRANS-CANADA Highway 1 westbound from Calgary to Kamloops. Once in Kamloops, take the Highway 5 EXIT northbound to Jasper. Approx. 25 kilometres, look for signs to Heffley Creek and Sun Peaks Resort and turn right into Heffley Creek. Proceed along this two-lane road up the mountain…all the way to Sun Peaks Village. Approx. 25 – 30 minutes.